2. Dissolve ginger and garlic cubes into olive oil. 3. 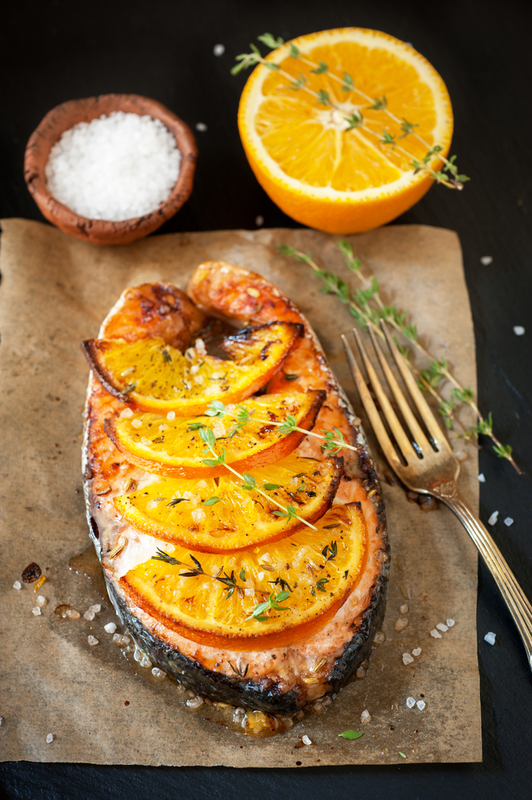 Place salmon, skin side down, on a non-stick baking sheet or in a non-stick pan with an oven-proof handle. 4. 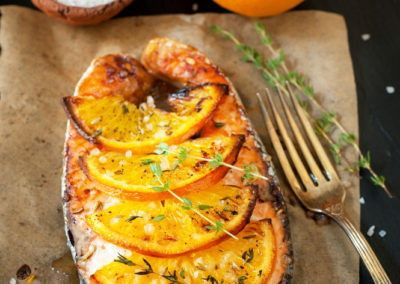 Spread olive oil – garlic – ginger mixture over the salmon using a basting brush. Sprinkle thyme, salt and pepper. 5. Cut orange in half. Squeeze fresh juice from one half over the salmon. Thinly slice the remaining half and place slices on top of salmon. 6. Loosely cover tray with another layer of aluminum foil. Bake until salmon is cooked through, about 12 to 15 minutes.